Come Party Like a Princess (or Diva)! Lots of Options here! 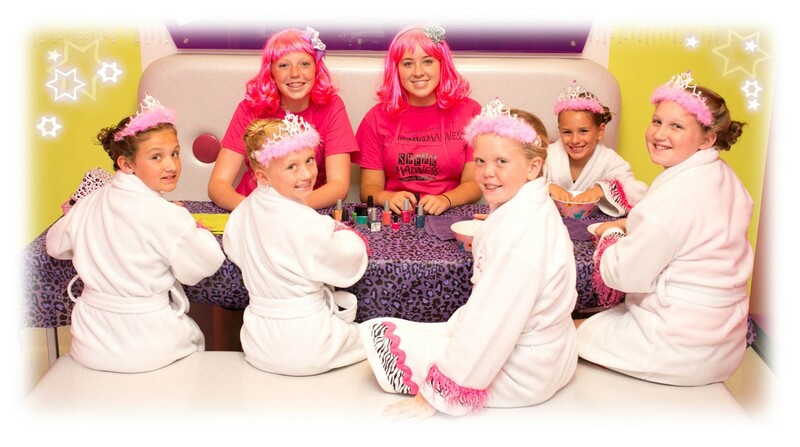 All parties contain Lots of Fun, a hair-do, painted nails, make up, Karaoke and time with our Pink Starlets! We can handle parties with lots of guests! Our minimum number is 6 girls and parties last 2 hours. Please call and we can give you ALL the ROYAL details! (210) 481-9300! Party Specifics: You are welcome to bring cake/cupcakes, drinks and pizza. We provide table cloths, but you will need to bring your special paper goods. A $50.00 deposit is required to reserve your desired time slot. The deposit is deducted from your balance due on the party day. Available times for parties: Please Call for details – (210) 481-9300. A Note on Cancellations: Rarely do we have party cancellations, HOWEVER if you must re-schedule or cancel your party reservation you MUST do so no later than 21 days prior to your reservation – or you will lose your deposit. Another Party Favorite: Diva Day Mini Makeovers! Our Pink Starlets will twist and twirl your pretty princess’ hair up into a sparkly hairdo (no curling irons used!) we paint her nails, then add a little glitter makeup to dazzle and daze even the most dashing and daring of, er, dads! This miniature glamour makeover is a perfect way to pamper just one or two of your favorite femmes and can be experienced and enjoyed any time! From Daddy-Daughter Dances to dating, Christenings to First Communions, we here at Shear Madness, Haircuts for Kids, know that sometimes life’s events are best experienced with a little glitz and glamour! 22502 US Highway 281 North Suite 109 Right next to Mooyah’s Burgers!